"No wonder we are down to a 5% white population." I read this somewhere tonight. The person who wrote it was talking about the well known violence in the country, and the bad decisions the present government continues to make, almost on a daily basis. Most non-South Africans regard the country with an air of hesitant curiousity. Most non South Africans don't know what things were like in the day of the old Governemnt. They don't know that public places like restaurants and beaches and parks were designated "Whites only". 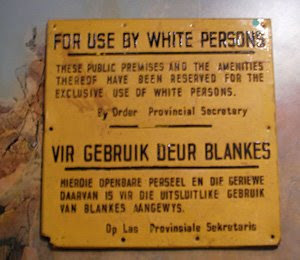 That public washrooms were for "Whites only". That the native people wre not allowed to be seen in public after a certain times at night (remember the "dompass laws"?). That residential areas were segregated along lines of colour and people were forbidden from marrying or having relationships across the colour bars. If anyone dared break these laws, they would be thrown into jail...and beaten to within an inch of their lives. Many did lose their lives due to these beatings. What percentage of Non-whites suffered under those laws? How long did that tyranny go on for? If you're going to go there, let's look at the big picture. People who were treated worse than animals. People who were denied basic human rights; a right to freedom, a right to education, a right to free thought and speech. Those people were suddenly told "Okay you can go. Be like everyone else. After all these years, just go". Of course there would be tyranny. Of course there would be rage and blood shed. I don't agree with it.